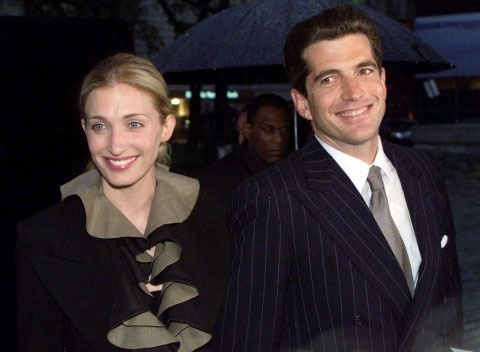 JFK Jr. and his wife Carolyn, 1996. Getty Images photo. I used to attend a poetry and fiction writing workshop every Wednesday night that took place in the home of the instructor, who lived in Tribeca. The sessions normally ended at around 10 or so and anyone who wanted to join the group would head to Walker’s, a nearby restaurant, to grab a bite to eat or drink. Walker’s was next door to the loft apartment that John shared with his wife Carolyn. One night, past eleven, I was sitting in Walker’s with my writing cohorts when I looked out the window and there was John, just outside, alone, walking towards his building. He was tall, extremely handsome, in a suit and tie, with a little smile on his face. He was absolutely alone—his wife wasn’t with him, there were no photographers around, there was no one else even on the sidewalk. He just seemed like a good-looking guy going home after a long day. None of my companions took note of him and I thought later that I was glad the one and only time I ever saw this man who had been photographed so many times over the course of his entire life was walking home at night as any private citizen would, as any New Yorker would, no one following him, no photographs being taken, no one even seeming to know who he was. He looked content and happy in that moment and that’s how I will always remember him. The day he died I was in California for a high school reunion and I could not believe he and his wife (and one of her sisters) was gone—John and Carolyn seemed like the Prince and Princess of Manhattan! One of my writing friends told me the Wednesday after John and Carolyn died Walkers was packed to the rafters with reporters and cameramen, all wanting to eat after the long day of staking out the front door of two people who had perished in an airplane crash. Honestly, what did they think they were going to see? Carolyn and John, May 1999. They both had incredible smiles! Photo by Mike Segar/Reuters. I was so sorry John and his wife came to such a sad end but I was also relieved his mother wasn’t alive when it happened. I don’t know that she could’ve survived the grief. I cannot believe it has been 17 years since he passed away. 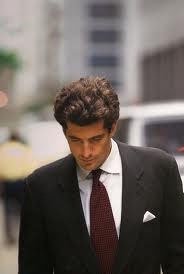 If you have a JFK Jr. story to share, I’d love to hear it. What about the mother of the Bessette sisters? That was who I was thinking about when I heard that reckless idiot, and criminally negligent, if he had lived should be viewed anvd charged if he had lived. There was a man on the tarmac who knew John-John fairly well and had the same exact plane only with many more years, and flight hours, of experience who warned that piece of garbage with very little experience not to go up because the cloud cover made it very dangerous for pilots of J-J's novice skill level who would be likely to have their visual bearings thrown off. Well the reckless moron went up anyway and killed those 2 beautiful young women due to the same pilot error the experienced pilot had wsrned him about on the tarmac. This is a post about JFK Jr. in connection with the article I read, which made a claim that everybody that lived in Manhattan at the same time that he did had a JFK Jr. story. That's it! I am not trying to take away anything from Carolyn's mother. I would never do anything like that. I cannot fathom the depths of grief her mother went through and probably feels to this day. However, I don't believe in calling JFK Jr. a piece of garbage, a moron, etc. Ever see his DNC speech? That man was a star. I am sure he brought his family, and his mother in particular, a lot of comfort after JFK was assassinated. I agree that he should not have been flying, but I do not see the point in calling him names now. He's dead and I'm sure he is still terribly missed by his family. I saw him 2x. Once as he was leaving Bubby's Restaurant in the A.M. He apparently frequented it for breakfast because it has great food and his apt. was very close. The other time he was on his bike riding around Tribeca, NY. I noticed this incredibly handsome young guy bicycling and then I realized it was John. I'm glad his mom didn't have to experience it either. The worst thing for a parent. What a great post! I don't have a JFK jr. story. I had not even been to NYC before he passed away but the reports and watches for his plane on the TV was all that my mom had on that day the plane was reported missing. He was one of her favorite celebrities. I got the People Magazine out now that had short stories by friends about JFK jr. You should get it! There is also a story on Queen Elizabeth's dresses that is really nice! I don't have a JKF Jr memory; but I did have a bit of a pause years ago whilst reading a Vanity Fair article about Gianni Agnelli (sp). They published a photo of an Agnelli nephew, and I thought it was JFK Jr. It made me google to see if it was possible that he was not biologically JFK's son.